I will be teaching two Reflexology hands-on workshops at this amazing festival on Canaan Downs! Hope to see you all there! *Basic Detox Program (14 days) -- Kick-start your body to heal, rejuvenate, and purify. A cleansing program to keep your body/mind at its BEST. *Intensive Cleansing Program (7 days) -- Supercharge into the NEW YOU! Effectively and easily removes liver stagnation, gallstones, and negative emotions from this very important filter organ! An all natural way to reprogram your brain to burn fat rather than store it. Lose weight and keep it OFF. *Kidney Cleanse (3 weeks) -- Simple, easy, and effective! Remove accumulations of uric acid and kidney stones. Basic Detox Program (14 days) -- Kick-start your body to heal, rejuvenate, and purify. A cleansing program to keep your body/mind at its BEST. Cleansing or Detoxification is a great way to RE-SET the body and boost the immune system. My mantra is "OUT with the OLD, make SPACE for the NEW." Time to clear out all the over-indulgence and toxic accumulations (both physical and emotional) to get our bodies back to optimal functioning. Detoxing can be a way to bring yourself back into FULL-POWER and maximize your potential. Regular Cleansing is one of the BEST body maintenance routines you can do for yourself. Clearing the body and mind of the old keeps you at your BEST! This course program is open to any and everyone...no experience necessary! Not for pregnant or breastfeeding women. This cleanse is designed to purify the body so that it may heal more easily. It clears the eliminative channels so that the body may rid itself of waste matter, and therefore function more efficiently. This cleanse will eliminate toxic lymph, mucous, catarrh, and excess acids. It will help normalize they body’s weight and prepare the body for regeneration. By purifying the bowel, organs and other eliminative channels we assist the body to repair, heal, and regenerate itself with new healthy cells. Clean excess mucous out of the body; mucous is a source of polyps, tumors, cysts, etc. and also can exasperate allergic, disease, pain, and inflammatory symptoms. Give you foods that are alive, of the highest nutritive value, and all around healthful, foods which can regenerate and rebuild your body. Provide you with herbal formulas, naturopathic techniques, and corrective aids to facilitate healing and regeneration of the body. Release static electricity from the body which helps eliminate frustration, confusion, and negative emotions. Free up energy within your body for repair. You will likely need less sleep and feel more energized. Help you to determine if you have any food allergies or sensitivities. Change your relationship to food and to your body. At least Half Payment must be made prior to commencing. Payment plans can be arranged on an individual basis. If you have already had a consultation with me recently (or have other circumstances) then the course fee can be adjusted. Course fee is 100% non-refundable. 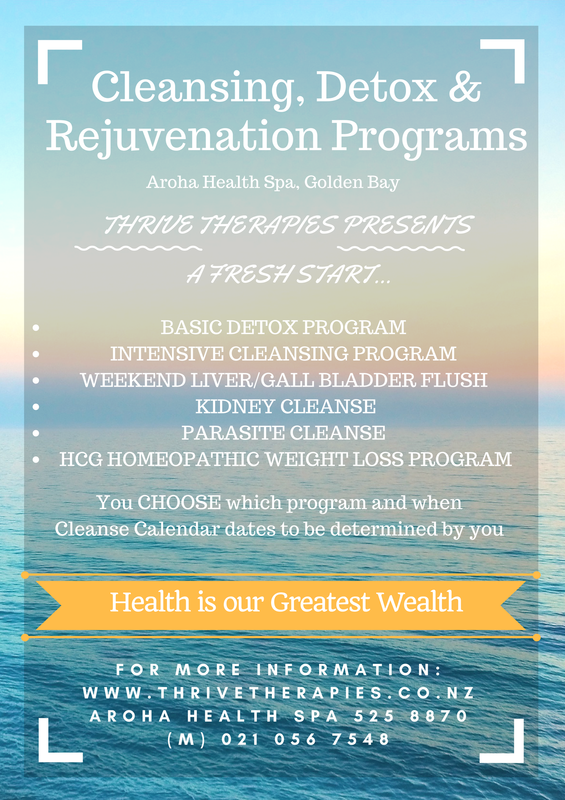 All meetings and sessions will be held at Aroha Health Spa in Pohara. Intensive Cleansing Program (7 days) -- Supercharge into the NEW YOU! This cleansing program is similar to the Basic Cleanse only that it is a bit more intensive. It will achieve all of the same benefits as the Basic cleanse. We will focus the cleanse into one week where you will have 6 colonics within this week. This allows the body to delve even deeper into the tissues to clear congestion and encourages a greater release of toxins. There is a beneficial and recommended (but optional) 1 week preparatory phase. The Intensive Cleanse is suitable for more experienced people who have done cleansing previously, but exceptions can be made on an individual basis. Guidance and detailed Instructions on the Purification Diet and Purifying Juice Cleanse as an Internal Body Cleanse Program. During the winter months the liquids will be focused more on bone broths, miso, soups, and warming liquids. You will enjoy unlimited contact and support from me as you need it and I will be checking in with each participant everyday by phone and/or email. Weekend Liver/Gall Bladder Flush -- Effectively and easily removes liver stagnation, gallstones, and negative emotions from this very important filter organ! One of the main functions of the liver is to remove and breakdown toxins from the bloodstream. It also metabolizes drugs, including pharmaceutical drugs and alcohol. This usually means the Liver is one 'over-worked' organ. Every day and night your liver works hard for you effectively filtering your entire bloodstream. Cleaning and resting it once in a while is an amazing gift to your body. Cleansing the liver of gallstones dramatically improves digestion, which is the basis of your entire health. Allergies have been known to disappear too, more with each cleanse you do! Incredibly, it can also eliminate shoulder, upper arm, and upper back pain. You will likely have more energy and an increased sense of well being. Why is a Liver Flush so Important? Guidance and detailed Instructions on the Liver/Gall Bladder Flush as detailed by Andreas Moritz in his book "Timeless Secrets of Health and Rejuvenation"
Positive affirmations and interesting health related articles will be sent to you via email every few days. You will enjoy unlimited contact and support from me as you need it during the week and I will be checking in with each participant every few days by phone and/or email. You will need to have a supply of apple juice (about 6 liters preferably fresh and organic), 6 oz of grapefruit juice, and 4 oz of olive oil. I have plenty of apples on my land at certain times of year ( March/April/May) so you are welcome to come pick them for a koha. At least Half Payment must be made prior to commencing. Payment plans can be arranged on an individual basis. If you have already had a consultation with me recently (or have other circumstances) then the course fee can be adjusted. Course fee is 100% non-refundable. Have you ever dreamed of permanent weight loss but have just not been able to achieve it? Are you sick of yo-yo dieting? Are you ready for change? H.C.G. stands for Human Chorionic Gonadotropin. The HCG spray combined with a low calorie diet of 500 calories a day for 3 weeks, observing a strict, food specific, low calorie diet allows the body to burn fat at a rapid rate. While the dieter is on the HCG, the body utilizes the abnormal fat stores of the body for fuel. It is also theorized by the doctor who developed the diet, that the hypothalamus gland is reset at the end of the protocol improving the metabolism, and regulating the endocrine systems more efficiently. After the HCG Phase (also known as Phase 2 or P2), you can eat a normal calorie diet with a large variety of foods with the exception of starches and sugars for a period of 3 weeks - this is also called the Stabilization Phase (Phase 3). Finally the "Maintenance Phase" (also known as Phase 4) you can begin to slowly incorporate carbohydrates back into your diet and enjoy your new, faster metabolism. This is a 3 week program (low calorie with spray) and 3 weeks of slowly re-introducing foods to establish long term weight loss. The guided portion is for 4 weeks (the initial 3 weeks and then 1 week into the maintenance phase). Using the HCG drops draws on fat reserves to make up the remainder of calories needed to get through the day. The HCG program has been clinically trialed and proven to NOT use lean muscle or healthy fat reserves. If you have no excess fat - HCG will not work on you. HCG has successfully been used since the 1950’s where these drops were originally injected into the body by Doctors. Manutuke Herbs Drops are the homeopathic form and are in a simple oral spray administration and are non-invasive and easy to use. During the 3 week maintenance phase – no starch or sugar is consumed to ensure the hypothalamus is reset to use fat not store it. This makes the diet successful and must be done to get the best results. Your body will learn to use stored body fat for energy. As a health practitioner, I have trialed this program personally and have lost those extra kilos and kept them off. I have found this program to be excellent for me and most importantly the extra weight has been kept off long-term! I always try all the programs I have on offer before I recommend them. I was skeptical of this one at first but have definitely found it successful once I stuck with it. People who are insulin dependent, pregnant or breastfeeding are not able to do this program. You will enjoy unlimited contact and support from me as you need it during the program and I will be checking in with each participant every few days by phone and/or email. At least Half Payment must be made prior to commencing. Payment plans can be arranged on an individual basis. If you have already had a consultation with me recently (or have other circumstances) then the course fee can be adjusted. Program fee is 100% non-refundable. Why the Need for a Kidney Cleanse? The kidneys make a tremendous effort in trying to keep the body clear of toxic substances such as lead, cadmium, mercury and other impassable pollutants. They also maintain fluid and electrolyte balance and regulate the pressure from the heart that forces the blood through their filtering system. Kidney stones greatly impair this ability, which consequently increases the amounts of heavy metals and raises the body’s general level of toxicity. This can lead to infection, high blood pressure, heart disease, brain disorders, cancer and many other diseases. The following signs indicate the presence of crystals and stones in the kidneys or bladder: A dark or whitish color under the eyes; puffy or swollen eyes, particularly in the morning; deep wrinkles under and around the eyes; tiny whitish, tan-colored or dark lumps under the eyes, which can be felt or made visible when stretching the skin outwards towards the cheekbones; overlapping of the skin of the upper eyelid; chronic pain in the lower back; swelling of feet and legs; constant fear or anxiety. There are 9 herbs that can effectively dissolve kidney grease and kidney stones within a period of 20-30 days . Guidance and detailed Instructions on the Kidney Cleanse as detailed by Andreas Moritz in his book "Timeless Secrets of Health and Rejuvenation"
At least Half Payment must be made prior to commencing. Payment plans can be arranged on an individual basis. Course fee is 100% non-refundable. We all know that our intestines act to break down food, absorb nutrients, and eliminate waste. Lesser known is that the intestines help to maintain fluid and electrolyte balance and lymphatic drainage. This means that if the bowels become “unclean” or partially blocked then the toxins left begin to circulate into the body. This happens in virtually 100% of us because meats do not digest easily and milled/processed grains can leave a sticky glutinous residue on the intestinal wall and a gradual plaque build-up occurs similar to what happens on our teeth. Over the years we can accumulate putrid toxic matter in our intestines, often compacted and caught in the folds of the intestines. Add to this picture sugar, coffee, fried foods, cheese, processed foods, antibiotics, medications and our intestinal flora loses control and becomes overrun by candida, parasites, or other detrimental organisms. The immune system can become overloaded and our internal environment toxic which may lead to digestive disturbances such as IBS, diverticulitis or even bowel cancer, and poor nutrient absorption. Bowel Cancer is one of the most common cancers diagnosed in New Zealand. Utilizing Naturopathic techniques to clear and cleanse the body is one of the most efficient, easiest, and priceless health insurances.